Print using C-Line free downloadable insert template LBI35. 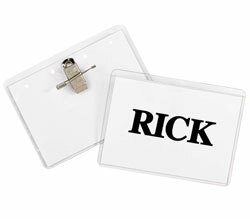 Replacement inserts let you use your plastic name badge holders over and over 3 1/2 x 2 1/4 size to fit C-Line 3 1/2 x 2 1/4 badge holders. Works with built-in templates in Microsoft Word and Corel WordPerfect. Print using C-Line free downloadable insert template LBI35. 8 badges per sheet; 7 sheets per package. 56/PK.